We are sad to report that another sweet greyhound has gone to the bridge. Mikey was adopted by Jeff and Nancy Bowman after he was returned to our group several years ago. 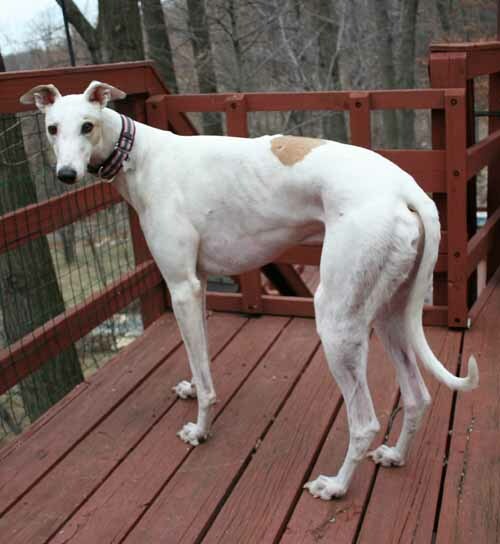 We thought that Mikey was an exceptionally sweet and gentle greyhound; he was returned through no fault of his own. At the same time, Nancy and Jeff were looking for a second greyhound and met Mikey. Thanks to Jeff and Nancy, Mikey landed in his real forever home. Mikey got very sick suddenly and Nancy took him to the vet. The vet found out that he had a birth defect and his kidneys were extremely small. It was surprising that he was able to race and to live as long as he did. Because of the extent of his illness, Mikey could not be saved. We are sad to see a fairly young dog go, but we do know for sure that he had the very best home any greyhound could have. He was loved and cherished by the Bowman’s and that is what we hope to find for all of our adopted dogs. Rest in peace sweet Mikey and know that you were greatly loved.